Gordon is the strongest tropical system recorded so far in the Atlantic Basin this year. Gordon collided with Santa Maria Island in the eastern Azores early Monday morning. Gordon weakened to a post-tropical cyclone by now thanks to cooler waters, however, it continues to pound these islands with winds strong enough to cause power outages and cause damage to infrastructure. 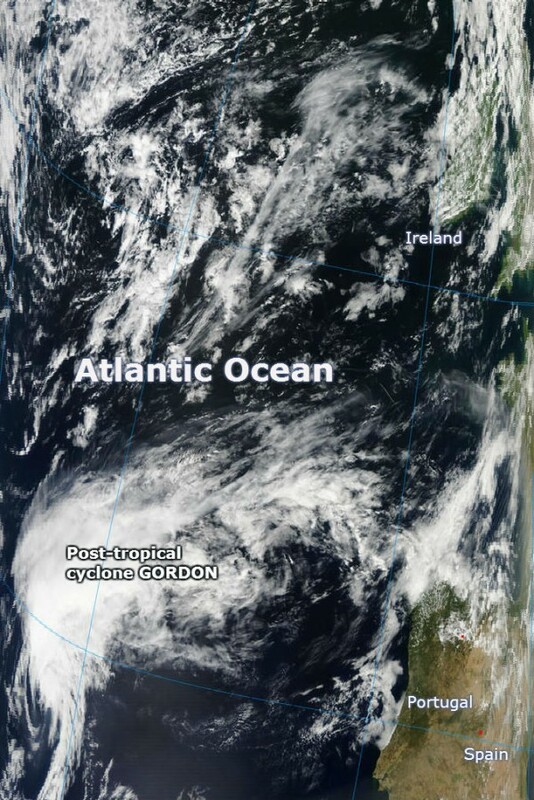 Satellite images and surface data indicate that Gordon has lost tropical characteristics. According to latest public advisory by US National Hurricane Center, the center of post-tropical cyclone Gordon was located latitude 39.2N and longitude 20.3W. The low pressure system is moving east-northeastward at speed of 26 km/h (16 mph). A decrease in forward speed and a turn toward the east are expected in the next 6 to 12 hours. A turn toward the south is expected by tomorrow night. Additional weakening is forecast and the system is expected to dissipate in a couple of days. Flash floods remain a serious concern regarding a steep mountainous terrain on islands. Azores are battered by rough surf and pounding waves kicked up by Gordon. Damage in the Azores was mostly limited to broken doors and windows, with no reports of injuries. Most of the damage was in agriculture. Beachfront homes and communities experienced coastal flooding. Azores already confronted Gordon. The last time a hurricane was named Gordon in the Atlantic, in 2006, the Azores were it's target. It made landfall on Sept. 19-20 as a Category 1 hurricane, producing a wind gust of 130 km/h (82 mph) on Santa Maria island. It caused power outages and minor infrastructure damage. 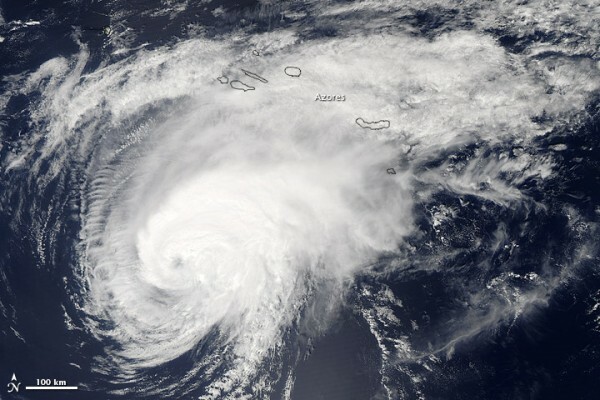 After crossing Azores it lost tropic characteristics, however, it unleashed high wind and rain across western Europe.